CHICAGO — On a recent evening, two inches of rain soaked the city, overwhelming the combined sewer system and forcing human waste into the Chicago River. It triggered an outfall sensor. Ian Hughes’ iPhone chirped. New email. He clicked the link and shook his head. Another day, another storm. Another threat to his favorite beverage, a threat his government blames on a warming world. 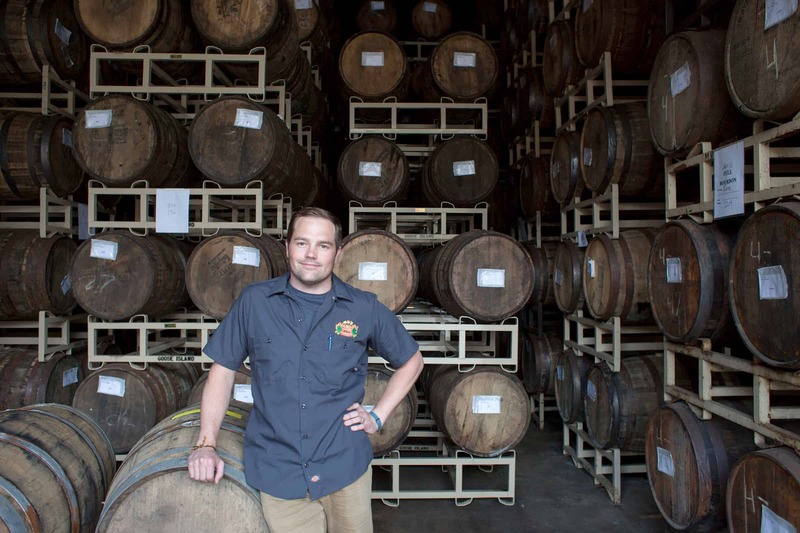 Hughes, 32, is the assistant manager of Goose Island Beer Co. Like a sudsy Clark Kent, he leads a double life: By day, he makes beer. On nights and weekends, he defends it. 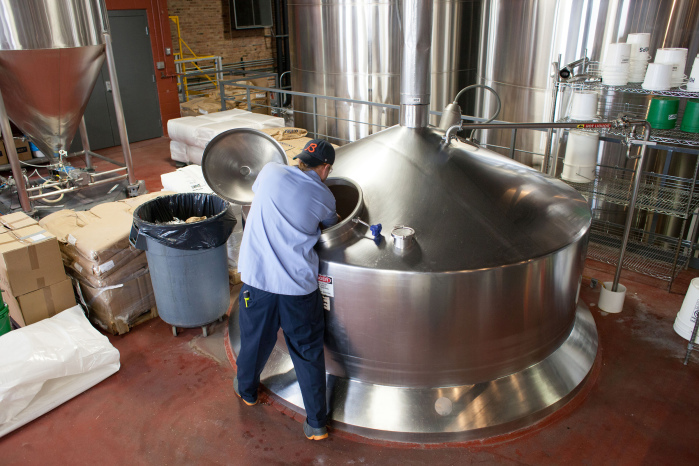 Goose Island uses about 50,000 gallons of Lake Michigan water every day to produce a rotating selection of craft brews. The best seller, poured countrywide, is 312 Urban Wheat Ale. That beer mostly starts out as water from Chicago’s municipal supply, which is copious, glittering and immortalized in two blue bands on the city’s flag. The water is a brewer’s dream. Hughes wants to keep it that way. Climate change appears to be complicating his task. Nowadays, sewage empties into the Chicago River when an inch of rain falls citywide, according to the Natural Resource Defense Council. Hughes, a self-described water fanatic, signed up for a city email alert to track how often this happens: 63 days last year, 36 days so far this year. When five-inch storms drench Chicago in a 12-hour window, the river is reversed away from the Mississippi Basin and into Lake Michigan, shutting down the area beaches for three days and tainting Goose Island’s most important resource. That happened about once every 10 years until the 1970s, city records show. In the past five years, it’s happened an unprecedented three times. The National Climate Change Assessment, released by the Obama administration in May, claims the “frequency and intensity” of these downpours could triple in the Midwest over the next century. Scientists blame climate change, although rainfall patterns are murkier to gauge than rising sea levels. About 40 percent of the region’s annual rainfall can come from the 10 heaviest storms — the kind that propel feces into fresh water. Hughes lived in four states growing up. He found home in water. Each Fourth of July, his family, no matter how far they’d scattered, met at his grandparents’ Ohio farm. He couldn’t wait to leap off the single dock into their pond. Dog-paddling through the cool, clear water. Swaying plants. Flitting minnows. Years later, as a graduate student at Ohio University, Hughes’ environmental science course work led him down a stream in the state’s southeastern woods, testing Ph levels where no fish swam. Sulfur bit his nose. The culprit: Acidic drainage from a former coal mine. It was the first time he stood angry near water. He returned home and grabbed a beer. At 22, he started making his own. When friends came over to snag a free bottle, Hughes noticed something strange: They let him complain. That’s when Hughes discovered his super power. After graduation, he worked at a water resource-consulting firm in Cleveland for three years before transferring to Chicago. He volunteered evenings at Goose Island, cleaning tanks and chopping ginger for Christmas ales. He wanted to combine his passions. One night, the brewmaster offered him a job as an environmental safety manager, at a slight pay cut. Hughes accepted immediately. Free beer and less stress made it feel like a raise. Last year, an environmentalist friend asked him: Can you turn a keg into a soapbox? Now Hughes lectures about the importance of clean water at Northwestern University, the Great Lakes Water Conservation Conference in Grand Rapids, Mich., and, this spring, at the South By Southwest festival/conference in Austin, Texas. Each week, Hughes hosts a water-testing panel, sipping aqua specimens from seven brewery faucets, taking notes. He keeps an archive (summer lake, for example, typically tastes musty). If samples don’t pass inspection, brewing must halt — and a delay that costs the company thousands of dollars. He likes to point out that beer is 90 percent water. You can’t make beautiful art, Hughes says, on a messy canvas. During that recent storm, water pooled in the streets. Curb streams vanished into drains. And sewage emptied into the Chicago River. Hughes checked his email to see where, exactly. “Swimming, canoeing, or other activities where immersion in water is possible should be avoided,” the city alert said. It included a map. A red dot marked the South Fork of the South Branch — a stretch called Bubbly Creek. Hughes almost laughed. He knew the area. It was the worst pollution in Chicago history. Residents say Bubbly Creek still stinks. The past is a warning, Hughes believes. Meatpackers chucked carcasses into the river for years before Sinclair’s classic expose shocked the world. Human waste has been directed into the water, to prevent flooding, for just as long. It has not spoiled Hughes’ beer. Not yet.